You may remember that a couple of weeks ago I spent the evening being pampered at L’Occitane in Westfield and they kindly gave me a bag of goodies to take away with me. I’ve been trying them at home and have absolutely fallen in love with them. My favourite is the Essential Water, an alcohol free toner enriched with Immortelle flowers, which smells delicious. Its spray pump is so simple, yet so effective, and makes it a real pleasure to use; you never poor too much on your cotton pad so you don’t drown your face with product. Four squirts gives you just the right amount, meaning you can really cleanse your face and get rid of all the dirt. I’ve been using this instead of my regular toner and I find it leaves my face feeling fresh, yet not tight like my usual product tends to. I don’t know if it’s made a visual difference to my face (I look at it every day so it’s hard to tell a subtle change!) but it feels much better, brighter and radiant. As far as I’m concerned the feeling is worth paying for. I’ve also been using the Very Precious Brightening Concentrate under the Precious Cream. You need such a small amount of these that my trial samples will still last me a good few weeks, but in the meantime they’re light enough to wear under make-up but effective enough to use before bed. Again, they both smell delicious and feel utterly luxurious. If you get a chance I would recommend definitely popping down to your local branch and asking for some sample sizes to try. Once you’ve had a chance to test them at home I guarantee you’ll fall in love with them too. 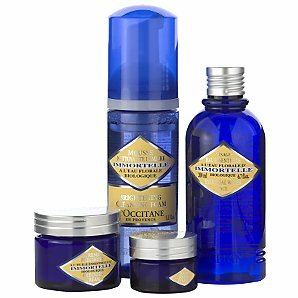 Normally I believe that you can always get a cheaper alternative to a lot of premium products, but with L’Occitane I think it’s about time I had a little treat.